CCS revival, but will it be different this time? In November last year, the UK government welcomed energy ministers, fossil fuel executives and other key figures from research and industry to Edinburgh for a major summit and conference on ‘accelerating carbon, capture, usage, and storage (CCUS)’. These events formed part of the UK government’s rejuvenated policy on the climate-change mitigation technology, which emerged around a year ago from the ashes of previous attempts to kick-start a CCUS industry – most notably, the last-minute cancellation of a £1 billion grant in November 2015. Driven by a persistent stream of expert reports on the need for CCUS in meeting global CO2 targets, and perhaps more importantly, the UK’s own binding ‘carbon budgets’, the government has been obliged to keep returning to the problem of CCUS. To coincide with the summit, the Department for Business, Energy and Industrial Strategy (BEIS) announced a new ambition to deploy a large CCUS project by the mid-2020s. For most of the delegates ascending Edinburgh’s Royal Mile, the burning question must surely have been: ‘What will be different this time?’. One thing which is clear is that there will be much less taxpayers’ money on the table than before. BEIS’s accompanying allocation of £45 million of innovation funding to CCUS, and rather more vaguely, a potential claim to some of £315 million dedicated to ‘decarbonising industrial sites’ are somewhat encouraging, but far from the heady days of the billion pound prize. The mantra for CCUS advocates worldwide nowadays is the ‘business case’ – a policy framework which can unlock private investment in the extensive infrastructure required to capture, transport, and permanently store CO2 deep in geological reservoirs. In July last year, a ‘Cost Challenge Taskforce’ of industry and academic experts reported to the UK government on exactly what this relationship between the public and private sectors should look like, and BEIS managed to rush out its response – ‘a CCUS deployment pathway’ – in time for the Edinburgh meeting. The leading near-term proposal in these documents is still based on the existing UK ‘contracts for difference’ mechanism for low- carbon energy generators, which guarantees energy prices over the market rate and would have driven the projects cancelled in 2015. However, much has been learnt from those failures. New ideas focus on reducing the burden of risk on project developers, and the need to develop a standalone business and infrastructure for the transport and storage of CO2, into which emitters can connect as necessary. The Taskforce recommend this should be operated on a regulated asset base model to reduce the risk to investors. The new emphasis on getting CO2 infrastructure in place goes hand in hand with a fundamental shift in perceptions of what CCUS should actually be used for. Once seen as synonymous with ‘clean coal’ and large fossil power plants, the carbon emissions now targeted are those from heavy industry and chemical plants – smaller sources which would need to form industrial ‘clusters’ and plug into a shared CO2 network. This idea is echoed internationally in a handful of nascent projects, particularly in Europe. Delegates heard several updates from Norway’s ‘full-chain CCS project’ based on connecting small coastal emitters with CO2-carrying ships, and the Netherlands’ Porthos project to develop a ‘pay- as-you-go’ CO2 pipeline and storage service for emitters throughout the heavily industrialised Port of Rotterdam. The UK appears to be unique in Europe for retaining an interest in power plants with CCUS, but clean coal has given way to clean gas. Probably the most significant announcement at the Edinburgh meetings was from the Oil and Gas Climate Initiative (OGCI), a consortium of major oil and gas companies which is launching pre-feasibility work for a 620 MW gas-fired power plant with CCS in the Teesside area of the UK (see Modern Power Systems, December 2018, p6). Home to a long-standing existing CCS initiative to link together non-power sector emitters, Teesside has gone from CCS also-ran to poster child. The proposed power plant is seen as an essential ‘anchor’ in the industrial cluster, with its large volume of emissions needed to improve the value of the shared infrastructure. The other holy grail for Edinburgh delegates could be seen in the quest for a CCUS ‘narrative’ – some kind of convincing justification for investing in the technology which can go further than numbers in convincing a doubtful public and cautious politicians. The shift in rhetoric (if not actual projects) away from the power sector already reflects this priority, as CCUS advocates have learnt to avoid squaring up to renewable energy in a popularity contest. The now-widespread addition of the ‘U’ for CO2 Usage to CCS is arguably also driven in large part by public relations, as an antidote to the unappealing ‘waste disposal’ image of CCS. Whilst the conversion of CO2 into saleable materials is a rapidly growing field, several speakers expressed scepticism about how much climate impact it can really make. Another key part of the new narrative is the potential to use CCUS with bioenergy to achieve negative CO2 emissions, which tend to feature heavily in ambitious climate scenarios such as the 1.5°C target. The UK’s bioenergy behemoth, Drax power station, has recently made moves in this direction with work to install a small CO2 capture test facility on one of its wood-fired boilers. Lastly, there is a growing emphasis on the role CCUS can play in job preservation and ensuring the continuity of industrial communities. This kind of soul-searching and rebranding is a familiar scene at CCUS research meetings, but it was somewhat surprising to see the same conversation played out among ministers and CEOs, who have it more within their power to drive the technology forwards regardless of narrative – or at least to lead the public and media debate. There is a sense that government and industry are both trying to convince each other to do more, resulting in an unhelpful deadlock. The overarching importance of government action was most clearly highlighted by the Summit’s co-host, the International Energy Agency, whose Executive Director Fatih Birol pointed out that public funding to CCUS over the last ten years amounts to only 3% of renewables funding in the last year. Internationally, there are very few examples of governments cracking the business case for CCUS, but a new tax credit (‘45Q’) to reward CO2 storage in the United States has generated the most optimism, and is already beginning to drive plans for new projects. Whether the UK can follow this lead remains to be seen; a series of new studies aimed at identifying the best policy pathway have been commissioned for release later this year. Some speakers warned that even the target of demonstrating CCUS in the mid-2020s requires greater action now, and there were concerns over the relatively cautious language in the government’s deployment pathway. However, if nothing else, the Edinburgh Summit sought to firmly position the UK as a global champion for CCUS – this can only serve to increase the pressure to follow words with deeds. Alongside the government-hosted CCUS events in Edinburgh came the launch of an in-depth feasibility study from the International CCS Knowledge Centre – an organisation formed by Saskpower and BHP to make the most of expertise gained from Canada’s pioneering Boundary Dam 3 (BD3) CCS project. The new study examines the retrofit of Saskpower’s 300 MW Shand coal- fired power plant with MHI’s CO2 capture technology and a conventional wet flue gas desulphurisation unit (provided by MHPS) – in contrast to the approach adopted at BD3, which was to employ Cansolv technology for both CO2 and SO2 removal. 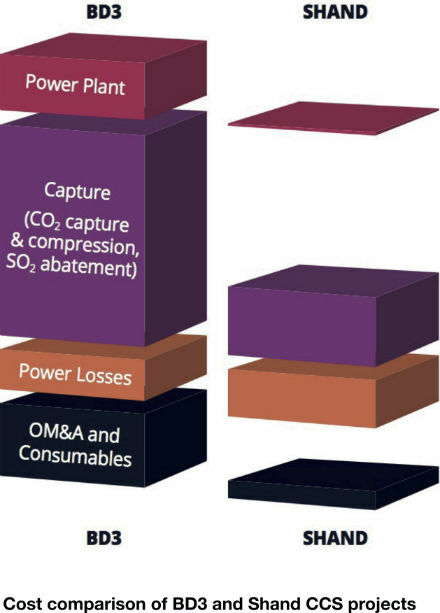 A remarkable 67% reduction in cost of capital (on a cost per tonne of CO2 basis) for the new project is partly associated with much less need for modifications to the power plant itself, but even greater savings were found in the capture plant through the increase in scale, use of modular construction, and lessons learnt from BD3. When combined with a 73% reduction in operating costs, the overall capture cost is estimated to be as low as 45 US$/t of CO2. Also highlighted is the capability to increase the CO2 capture rate to as high as 97% at lower loads, making it well suited to following variable renewable output. The additional water consumption of the retrofitted plant would be provided entirely by water from the lignite fuel, condensed in the capture process. Whether the Shand CCS project will actually go ahead is yet to be determined, and may depend on exactly how Canada’s federal CO2 regulations are implemented at the provincial level.